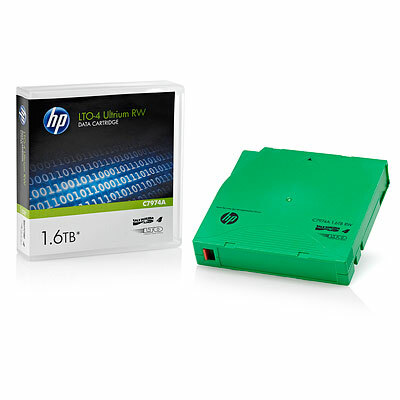 LTO 4 Ultrium Rewritable data cartridge is designed to take full advantage of LTO Ultrium technology and contain features that are exclusive to Hewlett-Packard. HP LTO Ultrium data cartridge features active internal head cleaning, self-diagnostic capacities, cartridge memory and are designed for long life and superior reliability. HP LTO 4 Ultrium offers a native AES-256 bit key encryption to help ensure your data is protected. Up to 1.6TB on one tape (compressed). Basefilm and coating technology has increased the bit density of the media, allowing more data to be saved in the same physical space. Holds 896 data tracks. With 240MB per second transfer rate, it takes just 8.3 seconds to back up 1GB of data to an Ultrium 4 cartridge.